spicy shrimp salad | Badudets Everything Nice! You haven’t traveled until you have eaten the food. This is what I believe when I travel. I’m glad I discovered Withlocals.com a few months ago. It lets you experience to dine and cook in a local’s house, it can’t get any authentic than that. During our Bangkok trip, I made sure to book an experience with Withlocals. I chose the one offered by Predaphol “Cook like a local!”. 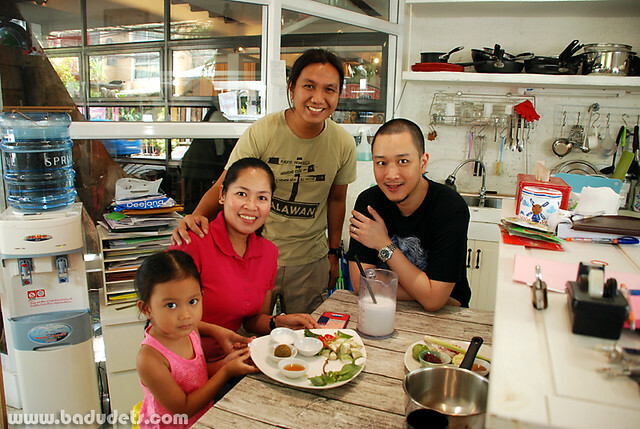 Not only we get to have a hearty lunch of Thai dishes, we get to learn to cook a few Thai dishes. Upon booking, Predophol or Phoom as his nickname, sent the menu and asked if we have special requests. Jeff likes Green Chicken Curry so I specifically mentioned that. We scheduled our Thai lunch on our 2nd day in Bangkok, our host, Phoom, gave his number and kept in touch during our trip. He even waited for us at the BTS station Chong Nonsi near his restaurant i-Gourmet. Yes, this guy is a chef so you’re sure to have a delicious meal with him.